Release Date: April 19th, 2006 (IFC Center) by Balcony Releasing. 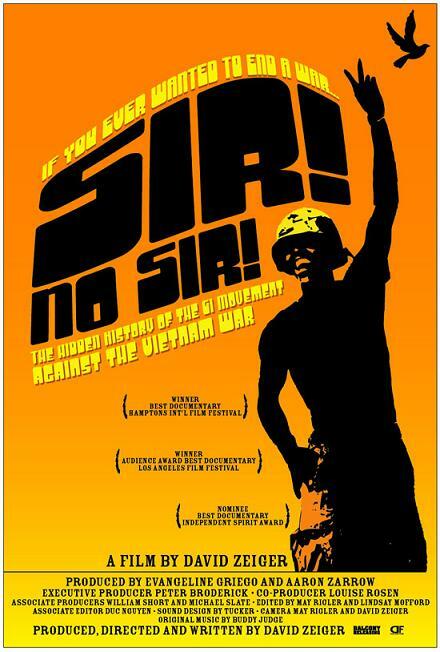 BASIC PREMISE: A documentary about the anti-war movement of GIs during the Vietnam War. ENTERTAINMENT VALUE: Before the Vietnam War, U.S. soldiers thought that they were actually fighting for a good cause, especially since they were serving their country. However, after the inhumane treatment of innocent Vietnamese civilians (also derogatorily called “gooks”), they started to feel as if something was wrong with their “mission”—a mission with no real purpose. Gradually, soldiers went AWOL and joined thousands in protest against the war back in the United States. Some of them landed in jail for failing to obey military orders and prison guards shot a prisoner for simply complaining about the war. In a particularly disturbing scene, a nurse recalls how he critically injured soldiers not only doubted that they fought for a cause, but begged him to kill them as well. During interviews with Jane Fonda, who recalls how she, along with Donald Sutherland, supported the anti-war movement through touring the country and exclaiming “Free the Army” which really meant “F*ck the Army!” Writer/director David Zieger expertly blends old footage with new footage to make this an easy-to-follow documentary. But what truly makes this riveting to watch are the one-on-one interviews with the veterans themselves who were among hundreds of thousands who participated in the anti-war movement to end the Vietnam War. SPIRITUAL VALUE: While watching this film, it’s difficult not to apply the same arguments to the current war going on in Iraq. Just like in the Vietnam War, U.S. soldiers are dying in battle, but for what cause? Throughout its moving interviews, Sir! No Sir! reminds you about the human aspects of war and how the conscience plays an important role, especially after witnessing many casualties. It provides no easy solutions, yet it does show how that it takes courage for thousands to rebel against their government, to fight for peace and, above all, to speak their minds with the utmost freedom of thought and expression. IN A NUTSHELL: Powerful, timely and moving! A must-see!